A recent article and video at the University of Pennsylvania's Penn Today highlights the work taking place to digitize all of the medieval manuscripts at Philadelphia area libraries. The project, Bibliotheca Philadelphiensis, fondly nicknamed BiblioPhilly, is a three year initiative funded by the Council of Library and Information Resources (CLIR), under the Digitizing Hidden Collections and Archives program supported by the Andrew W. Mellon Foundation. An initiative of PACSCL, the Philadelphia Area Consortium of Special Collections Libraries, BiblioPhilly is fiscally administered by Lehigh University. While a few of the fifteen libraries involved are scanning their own collections, the lion's share are being digitized at the University of Pennsylvania's Schoenberg Center for Electronic Text & Image (SCETI). While much of the action in the video takes place at Penn Libraries, the star of the show is really Lewis E 160, an illuminated manuscript of gospels, dated 1525 and created in Liège, Belgium. 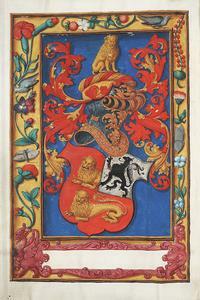 The manuscript was made for Jean de Falloize, a Burgomaster of Liège, whose familial arms appear on folio 1 verso. Jean served as a deacon to the Church, which would explain why he had this manuscript created. During the medieval and Renaissance periods, the deacon was a lay assistant to the priest who celebrated mass. One of the deacon's responsibilities was the Gospel reading for the day, either for Sunday services or for masses on special saints' days. Each manuscript is represented by several images. Once BiblioPhilly is complete next year, the manuscripts will be available in their entirety at OPenn, the University of Pennsylvania Libraries' website containing complete sets of high-resolution archival images of manuscripts from Penn and other institutions, along with machine-readable descriptions and technical metadata. Many of the images have already been uploaded to the site and can be downloaded at high resolution. Once it is cataloged and its images processed, Lewis E 160 will be available there as well. For more information, visit the Free Library of Philadelphia’s digital collection of medieval and Renaissance manuscripts. The star of the show—Lewis E 160, an illuminated manuscript of gospels, dated 1525 and created in Liège, Belgium.